Bagbey House, located at 134 Fourth Ave. N. will feature works by Bonnie Williams with Glass Onion Studio. Gallery 202, located at 202 S. Margin, will be featuring encaustic artist Chandra Adkins, a beekeeper who uses the ancient method of painting with layers of wax. Imaginebox Emporium, located at 311 North Margin, will showcase the work of author, sculptor &painter Cory Basil. Jack Yacoubian Jewelers, located at 300 Public Square will feature artist Susan Goshgarian McGrew, who maintains a studio in Nashville but also travels extensively with her art supplies, drawing inspiration from many worlds. Outdoor Classic Structures, located at 203 Second Ave. S. will feature winners of the first annual Art and Photography Contest hosted by Damico Frame & Art Gallery. Twine Graphics & Screen Printing, located at 304 Public Square will feature works by Terrell Thornhill who will display his reductive screen print fine art and demonstrating his printing processes. Visitors Center, located at 400 Main St. will feature artist Anthony Scarlati, a fine art portrait documentary photographer known for his soulful and thought-provoking images. Williamson County Archives, located at 611 W. Main St. will feature William Bell, who enjoys juxtaposing ideas and colors in his work. Williamson County Enrichment Center, located at 110 Everbright Ave. will feature Mandala art works by Massood Taj and the vibrant oil paintings of Caroline Thompson. The Downtown Franklin Association invites guests to stop by the Damico Frame & Art Gallery showing, which is themed “Home,” and open to the artists’ interpretation. A total of 15 winners will be on display, including first, second and third place in five possible categories. The art crawl trolley will also be available, sponsored by Genesis of Cool Springs. 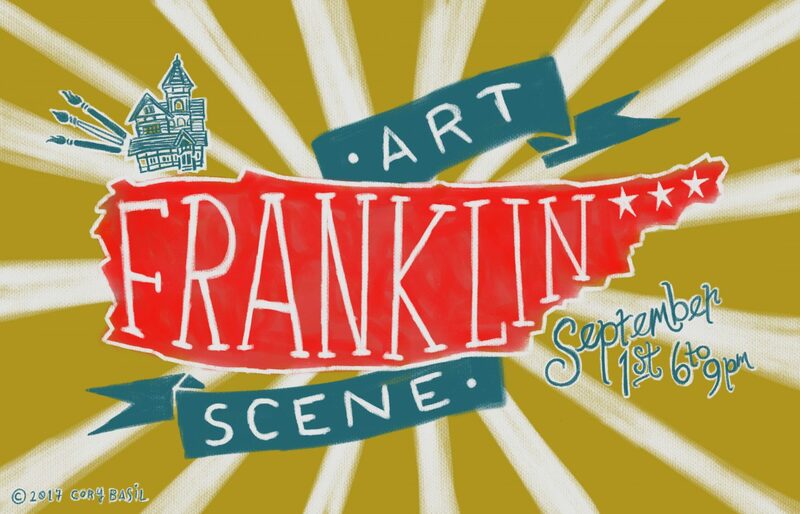 Franklin Art Scene guests may begin their crawl at any participating location on the map.